It’s OK to give people tasks that fit their skills or interests, with plenty of advance notice. Divvy up the preparation of dishes, wine purchase, the bringing of flatware, carving, later clean-up, the selection of music—whatever—among friends and family. Think through the dishes, the size of your group, and what you will prepare and serve food in. For big meals, I set out dishes with sticky notes about what’s going in them and where they will go on Turkey Day. Buy ingredients for all of the dishes featured here. If you want to add something like a fresh salad or vegetable, or a floral centerpiece, pick up those items very early the day before the holiday, or send someone to the store who has offered to help. Keep the last-minute list small so that you can breeze through the express lane while others lumber through check-out with overflowing carts. If you have kids or grandkids, have them make place cards or other table decorations. These will be talked about and treasured much more than anything you can buy at Pottery Barn. If the turkey is frozen, allow up to 3 days for it to thaw in the fridge. Make cranberry relish and refrigerate. Make pie crusts, roll them out, and refrigerate. Make the Seasoning Butter for the turkey and rub it into the bird. Truss the turkey and return to the refrigerator. Make the turkey stock for basting the bird and to include in the dressing. Make pumpkin soup. If using the pumpkin “shell” as a serving tureen, refrigerate it overnight too. Prepare the dressing up to the stage of adding the egg mixture and refrigerate. Make the biscuit dough and form biscuits. Refrigerate. Set the table, if possible. Remove the turkey from the refrigerator 1 hour before planning to cook it. Turn on ovens at least 30 minutes before you need them. If not done yet, set the table as early as possible. Chill wines and other beverages, as needed. Depending on where in the state you live, you may be able to simply leave them outdoors to give you extra fridge space. Let pumpkin “shell” tureen sit at room temperature. Arrange biscuits on baking sheets and let sit covered at room temperature. Mix up the dressing with egg mixture. Then bake dressing along with the turkey. They bake at the same temperature. Get out the cranberries, butter, and jam. After the turkey is done, let it sit while making gravy. Raise oven temperature and bake biscuits while turkey is resting and gravy is being made. Enjoy the meal and your guests. Give thanks. Back when the Pilgrims were still boys and girls in England, Don Juan de Oñate and his band of explorers enjoyed a feast of thanksgiving in 1598, near Las Cruces, as recorded by Gaspar Pérez de Villagrá, a poet who traveled with the expedition. That’s all the excuse we need for a Thanksgiving feast seasoned in New Mexican style. I always look forward to local flourishes that add zest to the traditional bird and trimmings. Perhaps the turkey will be seasoned with red chile, or the dressing—or even the cranberries—will be laced with green. 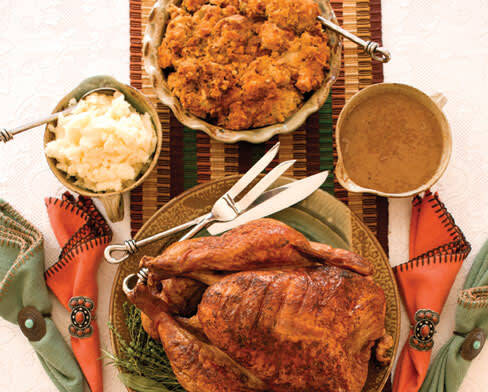 This holiday menu has enough familiar dishes to satisfy your aunt from Illinois, but captures the flavors of New Mexico in many ways.Start with a humanely raised turkey for your table by checking at a local farmers’ market, co-op store, or small grocery like Keller’s in Albuquerque, or Kaune’s in Santa Fe. Then season it with a chile butter, which adds sumptuous flavor not only to the bird but to the drippings, for gravy. The gravy’s red sheen looks dramatic against classic, creamy mashed potatoes. Of course, there’s dressing: cornbread-based and packed with savory chorizo. The biscuits have the subtle scent of corn as well, from a portion of masa flour, more common to tortillas or tamales. The sweet-and-tangy cranberry relish surprises with figs and pistachios, the pride of the Alamogordo area. Start the meal with soup made from a local pumpkin, and end with New Mexico apples piled high in a pie. Though we won’t all share the same table, we can share the same wishes for a bountiful harvest and celebratory dinner, and for good food to be available to all. Pumpkin soup makes a lovely starter for the holiday meal. Search out a real cooking pumpkin, not one grown for jack-o’-lantern looks. Be cautious when cutting, though, since the outer skin of these pumpkins in usually thicker than that of a Halloween pumpkin. Fresh chives, minced (optional)Cut top off pumpkin jack-o’-lantern style. Scoop out innards, separating flesh from seeds and related goo (discard the latter, or save seeds if you wish to toast them). Reserve pumpkin shell and lid, if you wish, as your serving tureen. Cut flesh into 1-inch chunks. In large saucepan or small stockpot, fry bacon over medium heat until brown and crisp, about 5 minutes. Remove bacon with slotted spoon, drain, and reserve. Into bacon drippings, stir celery root, leeks, garlic, and shallots, and sauté until lightly browned and somewhat soft, about 7 minutes. Add pumpkin flesh, stock, salt, and bouquet garni. Raise heat to high and bring to boil, then reduce heat to maintain low simmer, with occasional breaking bubbles. Cook about 45 minutes, until pumpkin is very soft. Remove and discard bouquet garni. Purée soup, either with immersion blender in pan or in batches in regular blender. (Don’t fill a regular blender any more than half full of hot liquid or it may blow its top.) Soup can be made ahead up to this point. Cool to room temperature, then refrigerate soup and bacon overnight. Before proceeding, let bacon sit at least 20 minutes at room temperature, and reheat soup, adding a little water if too thick to spoon easily. Adjust seasoning. Ladle soup into pumpkin tureen, if using. Serve in bowls piping hot and garnished with sprinkles of chile, bacon, and optional chives. If you buy a good-quality turkey, maybe even one that’s fresh, and roast it right, it doesn’t need to go through the brining process. I prefer a simple rubdown in seasoning butter the night before. This oven-roasted version is turned a couple of times during its baking process, which helps distribute the juices throughout the meat. Set aside a couple of washable mitts for turning. If you need to serve more people than this recipe accommodates, opt for another turkey of similar size rather than a single behemoth bird, which is likely to be tough. Whether you call it stuffing or dressing, bake the bread-based mixture outside the bird to lessen the chances of foodborne illness, and to give the mixture a crunchy top. This makes a fair bit of dressing—every group I’ve ever spent Thanksgiving with goes crazy for it, and I like having some left over, too. Preheat oven to 425˚ F. Grease rack of a roasting pan just larger than turkey. Slip fingers under the turkey’s skin to loosen it all over the top and sides of the bird, being careful not to tear it. Prepare seasoning butter, combining all ingredients in small bowl. Rub turkey meat under the skin and on the outside with butter mixture, especially under the breast. Truss turkey or tie its legs together if you wish. (Up to this point, turkey can be prepared a day ahead.) Let turkey sit covered at room temperature about 30 minutes. Place bird breast-side up on greased rack of roasting pan. Plan on a total cooking time of about 2 hours. Have a sturdy spatula and tongs handy to help turn turkey. Cook turkey for 15 minutes, remove from oven, and turn it breast-side down. Cook another 15 minutes. Turn heat down to 325˚ F and continue cooking another 15 minutes. Remove turkey from oven again and turn it breast-side up. Baste generously with some of remaining stock and any accumulated pan juices. Continue cooking about 1. hours more, basting with stock and pan drippings twice more, at 20-minute intervals. Don’t baste during last 30 minutes or so of cooking, so that skin has time to crisp. Turkey is ready when internal temperature at joint of thigh and leg reaches 170˚ F.
When turkey is done, remove from roasting pan and tent loosely with foil. Let sit 20 to 30 minutes. Meanwhile, prepare gravy. Place roasting pan with pan drippings over stove burner. Scrape any browned bits up from bottom. Sprinkle in flour and chile, and whisk it with drippings. Pour in remaining stock and bring mixture to boil. Reduce liquid as needed to make a thin gravy. Degrease it if you wish. Add salt to taste. Spoon gravy into boat or bowl. Serve turkey on platter with herb sprigs around it. Accompany with hot gravy and dressing. Preheat oven to 375° F. Place French-bread pieces on baking sheet and toast in oven about 10 minutes, or until golden brown and crisp. Set aside to cool, then dump into large bowl. Finish preparing dressing after turkey has roasted about 1. hours. Taste and adjust seasoning if you wish, or add a bit more stock if mixture seems dry. Whisk eggs and baking powder together and mix into dressing. Spoon dressing into baking dish, leaving it somewhat uneven on top, so that it will get extra-crunchy in some spots. Cover, place in oven with turkey, and bake 25 minutes. Uncover and continue baking about 20 additional minutes, until lightly browned and crusty on top. These decadent potatoes make an ideal pairing with the holiday bird and trimmings. A ricer, an inexpensive kitchen tool, makes exceptionally light and smooth mashed potatoes that are perfect for special occasions. You can smoosh the potatoes with a more common potato masher and leave a few lumps, if you wish. Either way, they’ll taste divine. Combine potatoes in large pan with 1½ tablespoons salt and water to cover by at least 1 inch. Bring to boil over high heat, then reduce heat to medium and cook until quite tender; 20 to 30 minutes, depending on size of potatoes. (Potatoes take longer to cook at higher altitudes.) When done, the exteriors of potatoes should be crumbly, almost dissolving in spots.While potatoes cook, warm milk over low heat in small pan deep enough to prevent milk from bubbling over as it heats. When milk is hot, remove it from heat and stir in sour cream. When potatoes are ready, drain and return to still-hot pan, cover with clean, folded dishtowel, and place lid back on pan. Towel will absorb steam, making potatoes drier. Let potatoes sit covered about 5 minutes. While potatoes are still very hot, mash or rice them back into pan. Stir warm milk into potatoes, then add butter a few tablespoons at a time, as much as your conscience allows. Season with pepper and, if you wish, with extra salt. Serve piping hot. Liven up cranberries with some New Mexico pistachios and figs and a mix of sweet and savory spices. I used Heart of the Desert’s green-chile pistachios in my most recent batch of this chunky relish. It can be made well ahead of turkey day, and is easy to whip up in larger quantities if you’d like to send guests home with their own small jars as a holiday treat. It’s fantastic on day-after turkey sandwiches. I’m grateful to Santa Fean Caroline Crosby for sharing the initial idea for this relish. Combine in saucepan the cranberries, sugar, orange and all juice, water, shallots, dried spices, and salt. Cook uncovered over medium-high heat, stirring occasionally, until sugar dissolves and cranberries pop and thicken. Stir in figs and pistachios and remove from heat. Cool, then refrigerate. The relish keeps for days. Add a little water if it becomes too thick to spoon easily. These biscuits feel familiar enough to be a part of a classic spread, but different enough to seem exciting. Corn masa has no gluten, so the biscuits are especially tender, with a delicate corn flavor (though this recipe is not gluten free). Slather with butter and your favorite jam, or maybe even some of the cranberry relish. Position 2 baking racks in upper and middle thirds of oven. Preheat oven to 450° F.
Buzz together in food processor 3. cups flour, masa, baking powder, and salt. Scatter butter over dry ingredients, then buzz again, just enough that butter disappears. Add lard and blend in with a few pulses. Pour in buttermilk and pulse a few more times until just incorporated, and a soft crumble dough is formed. Sprinkle work surface with about 1 tablespoon flour. Turn dough out, gather it into ball, and knead briefly, only until it just holds together (a dough scraper helps with this). Flatten dough into a round several inches thick, and dust top with sprinkling of additional flour. Using rolling pin, roll out dough to a round 1 inch thick. With biscuit cutter or round cookie cutter, slice down through dough to form biscuits. On 2 baking sheets, arrange biscuits at least 2 inches apart. Lightly pat remaining scraps of dough into a round 1 inch thick and cut into more biscuits. Bake biscuits about 15 minutes, or until golden and crisp. Halfway through baking time, switch positions of sheets in oven, from top to bottom and from front to back. Serve biscuits warm. High-Altitude Note: Reduce baking powder by 1 teaspoon and add 1 more tablespoon buttermilk to dough. The first time I ate apple pie with hard sauce was on a 1977 trip to Santa Fe, when I was still unfortunate enough to live elsewhere. One slice of the Pink Adobe’s signature dessert and I had another item to add to my growing list of reasons to someday live in New Mexico. This isn’t the restaurant’s pie or its style of sauce, but the Pink&apos;s late owner, Rosalea Murphy, always comes to mind whenever I put together this combination. Santa Fe Spirits makes a barrel-aged apple brandy that’s perfect as the “hard” part of the sauce, though you can use another apple brandy, or even any plain brandy you have on hand. The adult-rated sauce melts into rivulets over the warm pie, releasing the aroma of apples and brandy. For kids and teetotalers, a scoop of vanilla or cinnamon ice cream can be a welcome replacement. Lard and butter meld together for an extra-flavorful, ultra-flaky crust, but you can substitute vegetable shortening for lard. Get seasonal apples from a local market, pile them high, and you’ll have a remarkable pie. Prepare pie crust, first pulsing together flour and salt in food processor. Scatter butter over mixture and quickly pulse several times, to just submerge them in flour. Scoop lard or shortening into small spoonfuls and scatter over mixture; pulse again quickly several more times until it, too, disappears into flour. Sprinkle in 4 tablespoons water and pulse again quickly, until water just disappears. Dump mixture into large bowl or onto pastry board. Lightly rub dough with fingers, adding more water a tablespoon at a time, as needed. When dough holds together if compacted with your fingers, stop. It’s ready. Pat dough into two fat discs. Wrap dough in plastic and refrigerate at least 30 minutes. Preheat oven to 425˚ F. Fold up sides of large piece of foil to form drip pan for lower shelf of oven. Roll out each disc into a thin round an inch or two larger than pie pan. Arrange bottom crust in pie pan, avoiding stretching it. Even out any ragged edges, leaving about . inch of crust overhanging pan. Refrigerate pan with bottom crust and rolled-out top crust about 15 additional minutes. Prepare filling, first placing apples in medium bowl. Combine granulated sugar and cornstarch, and spoon half of mixture into bottom pie crust, where it can absorb and thicken the pie’s juices. Stir rest of sugar-cornstarch mixture into apples and mix with brown sugar, cinnamon to taste, salt, and nutmeg. Add lemon juice if apples are mostly sweet instead of tart. Spoon filling into crust, mounding it high in the center, and dot with butter. Top with second crust and crimp edge neatly. Cut several vent holes. Embellish top crust with any remaining pieces of dough, cut decoratively if you wish. Brush top with milk, then sprinkle lightly with sugar. Cover edge of pie with strip or two of foil. Bake pie 10 minutes, then reduce heat to 350˚ F. Continue baking another 50 to 55 minutes, removing foil for last 20 minutes. Pie is done when crust is golden brown and flaky. Let pie cool at least 1 hour, to allow juices to be reabsorbed. (Reheat pie, if you wish, in 300˚ F oven about 15 minutes.) Slice in wedges and serve, accompanied by Hard Sauce. 3 to 4 tablespoons apple brandy In mixing bowl, cream butter with electric mixer set to medium-high until light and fluffy (a couple of minutes). Stop mixer, scrape down sides of bowl, and add confectioners’ sugar. Beat slowly until sugar is incorporated. Continue to beat slowly, drizzling in brandy a tablespoon at a time until all is mixed in. The sauce should be like creamy butter. Scrape into small bowl or other container. Leave at room temperature if using within a few hours. Otherwise, cover and refrigerate for up to several days. Return to room temperature before serving a spoonful over each slice of warm apple pie. Cheryl Alters Jamison is New Mexico Magazine’s contributing culinary editor. Read her blog at nmmagazine.com/tastingnm. Jim Hammond is the author of Wines of Enchantment: A Guide to Finding and Enjoying the Wines of New Mexico (available at bit.ly/ShopNewMexico). See more of Douglas Merriam’s work at douglasmerriam.com. Sparkling wines kick off Thanksgiving feasts with a pop. Gruet Brut NV, Gruet Blanc de Noirs NV, and Gruet Sauvage NV are all excellent for this, and would also go very well with the Pumpkin Soup. The Gruet Rosé NV goes wonderfully with the dark turkey meat and the Cranberry-Pistachio-Fig Relish. Riesling’s crisp acidity and flavors of grapefruit, pear, and citrus go very well with turkey.Ponderosa Valley Vineyards makes a NM Riesling that is sweet and a Dry Riesling that really is dry (0.05% residual sugar). Ponderosa also has a late-harvest Riesling that would harmonize with the apple-pie dessert. Dixon’s La Chiripada Winery’s well-regarded 2012 Special Reserve Riesling and Black Mesa’s Woodnymph Riesling are also gems. La Viña, in southern New Mexico, makes a wonderful sémillon wine that is well matched to turkey. Red wines, when paired with turkey, need to be on the lighter side, like Vivác’s 2009 Nebbiolo. The Milagro 2010 Zinfandel is lighter-bodied than most California zins, with great structure, good acidity, and mellow tannins. The Milagro 2008 Merlot, just recently released, has aged into an elegant and complex wine. Pair the apple pie with a late-harvest white wine, like the Black Mesa 2009 Cosecha Ultima Late Harvest white, or La Chiripada’s 2010 Vino del Oro, a brandy-fortified muscat. For those who prefer port or sherry, there’s no better provider than Don Quixote Distillery and Winery; their Angelica Port is based on an old New Mexico recipe.